It’s possibly the most dominant run in Hearthstone’s history. 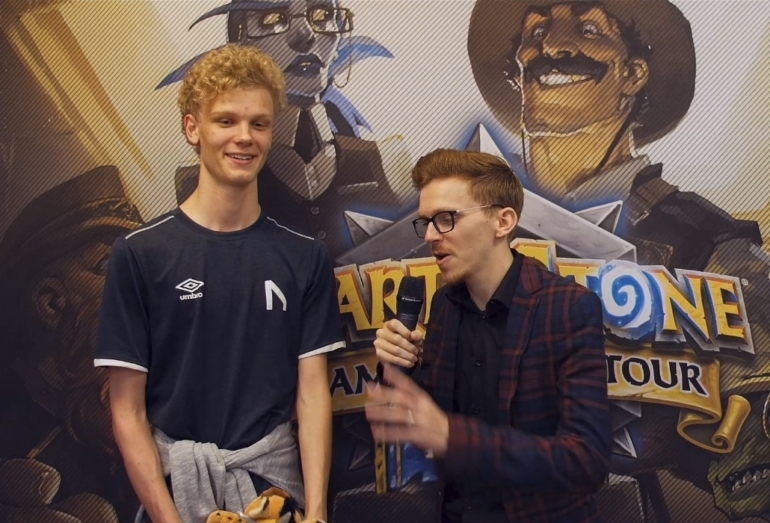 After racking up a second HCT Tour Stop win in the space of a month, Casper “Hunterace” Notto has solidified his place as they player to beat in Hearthstone right now. Hunterace outlasted over 500 other players at HCT Italy this weekend, taking home the first prize and the crucial Hearthstone Championship points. In the deeply competitive Swiss bracket, Hunterace had to win at least seven matches to advance to the top 16 playoffs. After a loss in round eight, he was faced with a do-or-die match against Torbin “Viper” Wahl—a man who recently qualified for the Hearthstone World Championship. Hunterace was able to win out and advance over arguably his toughest opponent of the tournament. In the playoffs, Hunterace’s hardest test came against a pair of highly regarded Americans from Tempo Storm—Muzahidul “Muzzy” Islam and David “JustSaiyan” Shan. Muzzy is currently the top player in the Americas HC point standings, while JustSaiyan was the top finisher in the season one rankings. After dispatching Saiyan 3-0 in the quarterfinals, Hunterace edged past Muzzy 3-2 to make the final. In the title match, Hunterace faced off with Alvar “Vardu” Dürris of the Finnish team Helsinki Reds, another player making his way around the Tour Stop circuit. It came down to a nail-biting game five Rogue mirror, with a clutch Leeroy and double Cold Blood combo snatching victory from the jaws of defeat for Hunterace. The win netted Hunterace 15 more points for his tally, taking him to 75 in total for the season. He’s finished in the top 25 of ladder in April, May, and June, as well as winning HCT Seoul last month. That means he can effectively not try for the next month and still qualify for the season two HCT Europe playoffs—but he’s already qualified for the Tour Stop in Tokyo at the end of the month. He’s also already planned a trip to Taiwan for the first Tour Stop of season three. Combine that with his 66 points in season one, including second place finishes at HCT Toronto and HCT Germany, and Hunterace’s talent is indisputable at this point. He’s unquestionably the most successful player of 2018 on the circuit—but time will tell if he can turn that into a berth for the World Championship at the end of it. The win also helped out his team, Nordavind. Hunterace and teammates Jaromír “Jarla” Vyskočil and Eirik “ntR” Midtstue are close to the top spot of the Blizzard team rankings, putting them in line for a big windfall at the end of the season. The top team will claim $7,500 each.